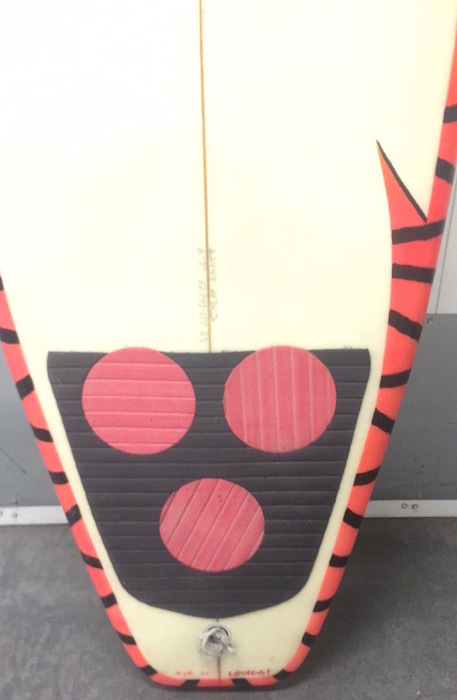 Shaun Tomson’s personal Al Merrick thruster (mid-late 1980s). Shaun was the 1977 IPS World Champion of Surfing. 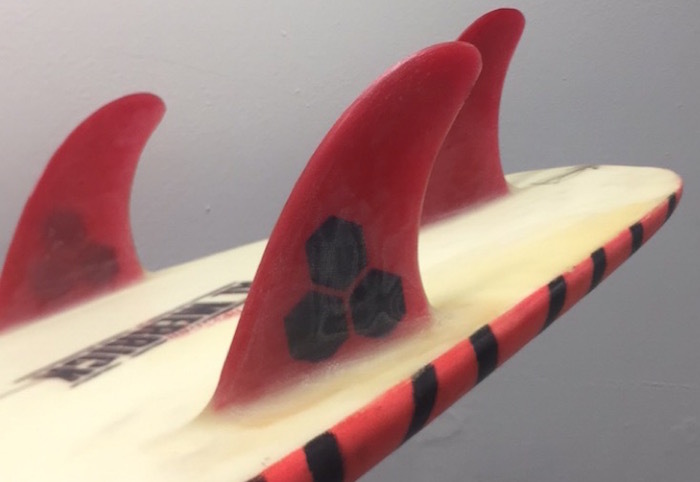 Cool retro airbrush with TNT exploding airbrush on the deck near the Shaun Tomson surfboards laminate. Nose was buckled and repaired at one point. Board also has a couple of small delam patches on the deck near tail. 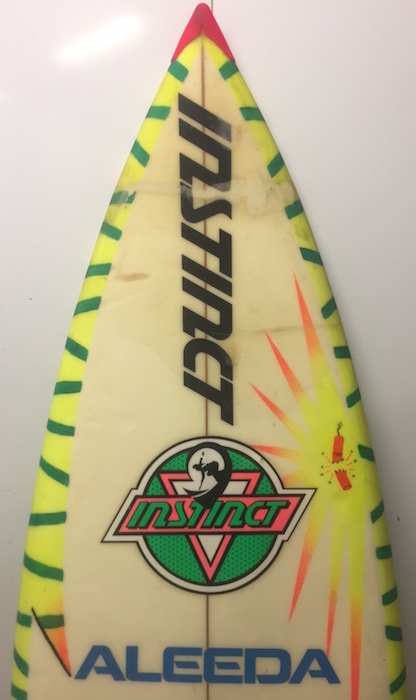 We are currently waiting on final confirmation that this was in fact Shaun’s personal board. 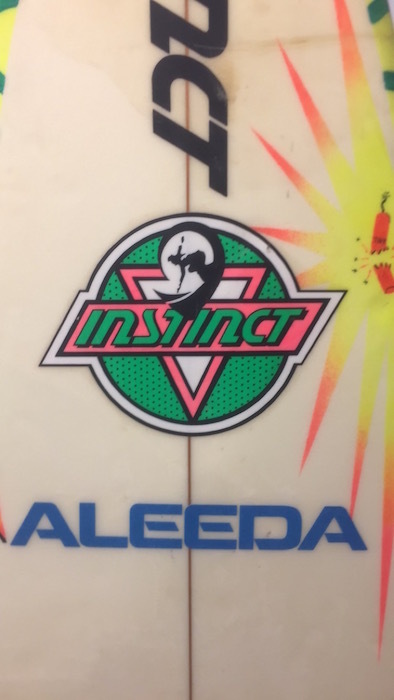 We expect to have official confirmation by the end of the month however we are quite certain this was Shaun’s personal board due to the under-glass sponsorship laminates (Instinct was the brand he founded in the 1980s) on the board and the location where this board was purchased, near Montecito, California where Shaun currently resides. Shaun Tomson: Won the highly coveted IPS World Championship in 1977. Started, managed and sold two multi-million dollar clothing brands – Instinct in the 80’s and Solitude (co-founded with his wife Carla) in the 90’s. He is the author of the best-selling book “Surfer’s Code“, and the writer and producer of the award-winning documentary film Bustin’ Down the Door. Inductee in the Jewish and South African Sports Hall of Fame, the US Surfing Hall of Fame, and has been described as one of the greatest surfers of all time (Surfing Magazine 2004) and one of the most influential surfers of the century (Surfer Magazine 1999). He is a board member and ambassador for Surfrider Foundation, the world’s largest environmental group dedicated to protecting the world’s oceans, waves and beaches and he received the SIMA Environmentalist of the Year Award in 2002. Born in Durban, South Africa. As a Jewish athlete, he was inducted into the International Jewish Sports Hall of Fame in 1995. He learned to surf in the beach breaks in and around Durban under the watchful eye of his father Ernie, and alongside older cousin Michael Tomson and brother Paul Tomson. Tomson attended school in Durban – Clifton Preparatory, Carmel College and the University of Natal, where he received a Bachelor of Commerce degree majoring in Business Finance. He graduated from Northeastern University with a Master of Science in Leadership with a focus on social change. Tomson went on to dominate amateur surfing competition in South Africa and began venturing over to Hawaii in the late 1960s, courtesy of a bar mitzvah present from his father. It was on one of these trips that an awestruck 14-year-old Tomson witnessed at first hand the so-called “Biggest Wave Ever Ridden” by Californian Greg Noll at Makaha in 1969. Hawaii’s surf proved to be a daunting challenge for Tomson, but he continued to mature and train in South Africa’s hollow waves, such as Cave Rock, the Bay Of Plenty, and Jeffrey’s Bay. In 1975, Tomson was an integral part of the “Free Ride” generation. Along with Australians Wayne Bartholomew, Mark Richards, Ian Cairns, Peter Townend, and Mark Warren, they rode the infamous waves along Oahu’s legendary North Shore with a style, aggression, and raw courage unseen prior to their arrival. Collectively, these surfers changed the face of surfing and were the first to really apply themselves as serious professional surfers. With his good looks, eloquence, and undeniable athleticism, Tomson served by default as the face and voice of this movement and he is still viewed as the prototype blueprint for today’s pro surfer, with legions of fans throughout the world. On a performance level, Tomson completely changed the way the tube section of the wave was ridden, using a unique style of pumping and weaving through and around collapsing sections of the barrel. Even today, his electrifying performances at Off The Wall and Backdoor Pipeline stand the test of time. A memorable quote of his from the period was, “Time is expanded inside the tube.” A very underrated aspect of Tomson’s inventiveness was his in the tube punch throughs where he escaped unscathed from hideous closeout sections over a shallow reef.